Before you apply for a USPS position, you need to make sure you are eligible and meet all of the post office job requirements. Each US Postal Service job will have job qualification standards listed within the specific job posting. 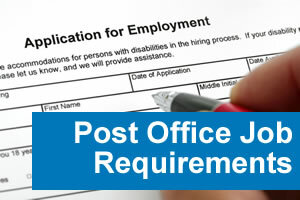 Post office job requirements include: age, citizenship, physicals, driver’s license, and exam scores. Postal job applicants must meet minimum age requirements and pass a postal exam for the majority of positions. USPS jobs also have citizenship requirements, require passing a drug test and background check, and registration with Selective Service. Post office positions that involve driving will also require a valid driver’s license and safe driving record. When you apply for a job, the postal service will schedule and coordinate all the required testing as applicable. For detailed requirements, see the areas below. The vast majority of post office positions require an applicant to pass a postal exam. Postal Exam 473 is the exam that is required for the most job openings (including mail processing clerk, city/rural carriers, and sales/service/distribution associates). Tip: You can find free postal exam practice tests at Test-Guide.com. The minimum age may be lowered to 16 for high school graduates. Also, applicants who have terminated their formal education for appropriate reasons (as certified by local school authorities) may be allowed to apply. Postal Inspector positions have different age requirements. An applicant for a postal inspector job must be at least 21 years old, but no older than 36. Note: Local post office area Vice Presidents have the ability to modify the age requirements if they are facing difficulty finding enough appropriate candidates. In these situations, the general minimum age limit may he reduced to 17 for non-high school graduates. During the holiday season, local post offices may also allow applicants 16 years old or older to apply. These special cases still must meet all of the requirements of the Fair Labor Standards Act. Postal workers under 18 will not be allowed to operate: motor vehicles, power-driven hoisting apparatus, or power-driven woodworking/metalworking machines. Employees must be a United States citizen, a lawful permanent resident alien (i.e., possession of a “green card”), or a citizen of American Samoa or any other territory owing permanent allegiance to the United States. You are not eligible for postal employment if you are only granted refugee status, asylum status or conditional permanent resident status. The US Postal Service is requred (by the Immigration Reform and Control Act of 1986) to verify and document the eligibility of all new employees. This act also makes it illegal to hire unauthorized aliens. If you have been granted lawful permanent resident alien status, you are eligible for all postal positions below level EAS-19. Area Vice Presidents can make exceptions to allow appointments of noncitizens to position higher than EAS-19. Candidates must display a basic competency in English. The postal service requires male job applicants to be appropriately registered with the Selective Service System. This requirement specifically applies to males between 18 and 25, including permanent resident aliens. If you are a male between 18 and 25, the US Postal Service will require you to certify that you have registered with the Selective Service, or present proof of exemption. Job applicants will use Form 61 (Appointment Affidavit) either during the application interview or the job offer stage. Note: Because Selective Service registration is such a simple process, job applicants can provide proof of registration on the same day. This will insure that the screening process can continue without interruption. Applicants must provide a ten year employment history or back to their 16th birthday. This employment history must include the names of all employers, including any current employers. The postal service believes that a candidate’s work history provides a key indicator of the potential job performance. A continuous and stable employment history generally indicates that a candidate will be a productive employee of the USPS. The interviewer will pay close attention to why an applicant has left previous jobs (whether from firing, quitting or other reasons). Military service is treated as prior employment. Veterans must indicate service and submit Copy 4 of the DD Form 214, Certificate of Release or Discharge from Active Duty. If a candidate left military service with anything other than an honorable discharge, the postal service will take additional steps to understand and evaluate the reasons. Criminal checks are required prior to employment. Having a prior criminal conviction, or a pending criminal charge does not necessarily mean that you cannot work for the US Postal Service. The USPS has publicly stated that they have an obligation to the public and the workforce to individually evaluate an applicant’s prior criminal history. The post office also realizes that many applicants with criminal records have shown that they have successfully rehabilitated and are capable of adequately performing in a role working for the postal service. A successful passing of an urinalysis drug screen is required for postal employment. An applicant must be determined to be drug-free (“Qualified Status”) in order to be eligible for employment with the postal service. A Qualified Status is valid for 90 days from the date of the specimen collection. A health assessment is conducted to determine medical suitability for a specific position. This medical assessment is given after a candidate has been granted a conditional offer of employment. Health assessments are mandatory for all career and non-career positions. The stated purpose of the health screening is to insure that an applicant is capable of performing the job’s duties without harming themselves or others. Suspended – If a candidate has had their driving priveleges suspended one or more time in the past three years, or two or more times in the past five years. Revoked – If a candidate has had their driving priveleges revoked one or more times in the past five years. For more details on Post Office Job Requirements, see the EL-312 employment and placement handbook.